Download the New Zealand property report in full. The Manawatu-Wanganui region has hit the property sweet spot not only with locals, but with Aucklanders and Wellingtonians who are increasingly searching for property on realestate.co.nz. The search is most popular among those in the 25 – 44 year old age group. 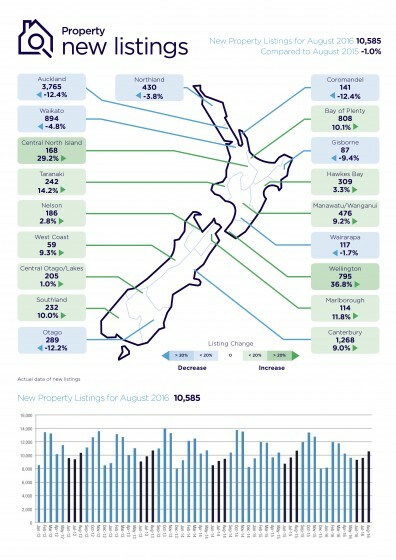 Real time statistics from realestate.co.nz for the month ending October, show that demand (as measured by taking the number of listing views of residential properties on the site and comparing it with the average number of views over the previous 12 months*) is up 50.4 per cent in Manawatu-Wanganui. Over the same period, demand for property in Auckland has fallen by 9.7 per cent. “Kiwis across the country aspire to own their own home and while most of the people searching in Manawatu-Wanganui are from the local area, 33.4 per cent more Aucklanders are also looking in the region (when compared with the same time last year) for the perfect match for their budget,” says realestate.co.nz CEO Brendon Skipper. Wellingtonians are also keen on the Manawatu-Wanganui region, with a 53 per cent increase in site users viewing properties in this region when compared with the same month last year (October 2015). Most of the attention in the region is on Palmerston North. The city has a long-term reputation as being one of the most affordable centres in New Zealand. The average asking price for a home in Manawatu-Wanganui is $288,267, compared with Auckland which in the same month rose to another all-time high of $943,258. 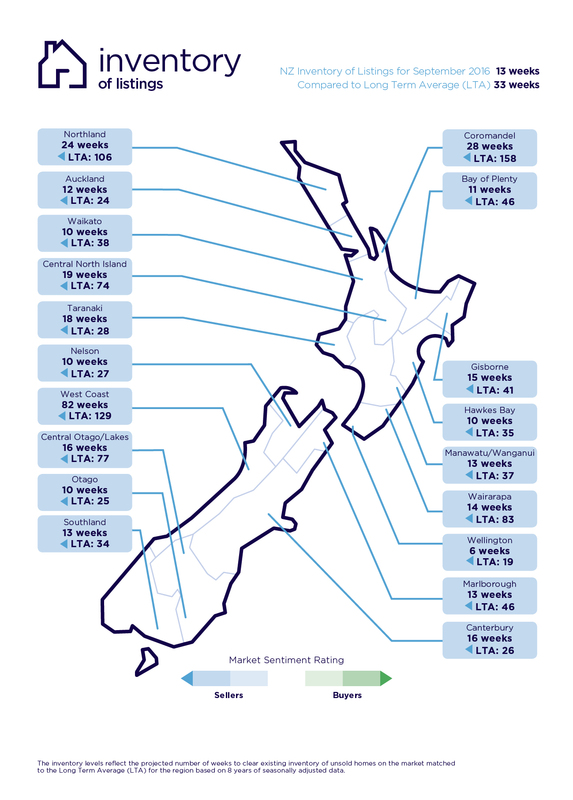 Of the 19 regions across the country, there are only two regions (West Coast and Southland) where the average asking price is lower than Manawatu-Wanganui. “It makes sense that Aucklanders would be looking at other regions and not only exploring investment options, but also weighing up the lifestyle benefits of a move outside of the big city,” says Brendon. In addition to popular West Coast beaches, Manawatu-Wanganui is well located for visiting other regions. Wellington, Wairarapa, Wanganui, Taupo, Hawke’s Bay and the Ohakune ski fields are all within a three-hour drive. In the October realestate.co.nz rental yield statistics, Manawatu-Wanganui is ranked the third best place to invest in a rental property. Investors would theoretically receive 5.3 per cent yield over a 12-month period – based on realestate.co.nz’s calculation of average asking price vs weekly rental price, excluding all external costs. 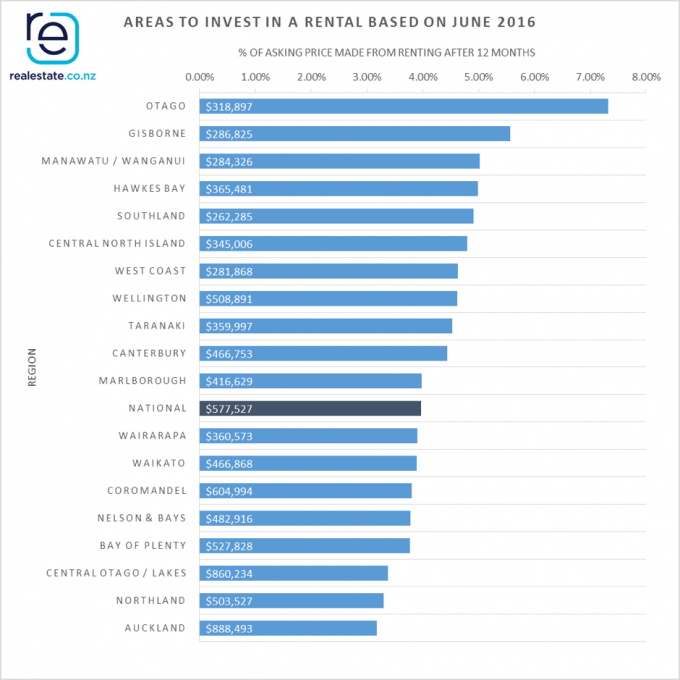 Another solid reason to look at investing in Manawatu-Wanganui. 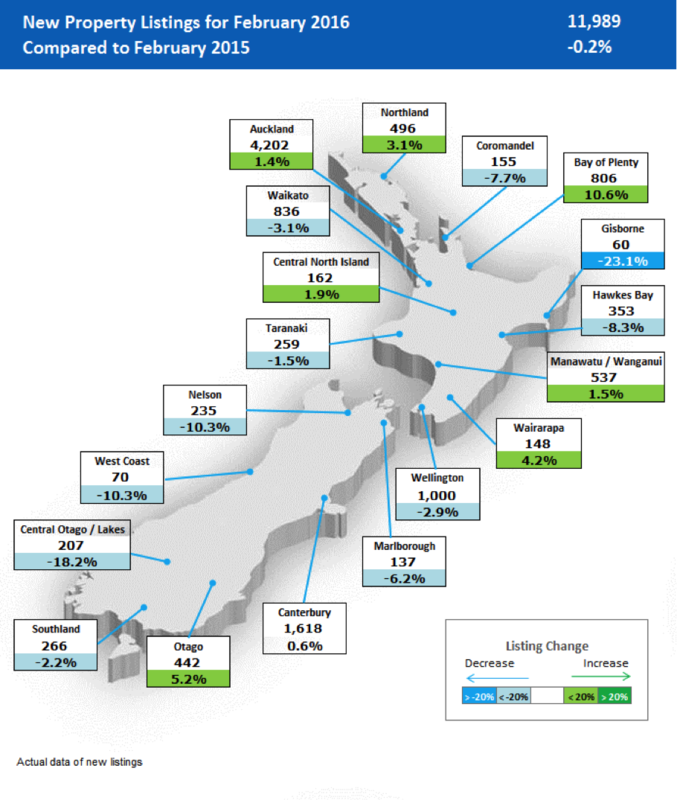 Auckland was the only region across the country where the total number of residential dwellings for sale (inventory) was up, compared to October 2015. Total stock fell in all other regions across New Zealand. 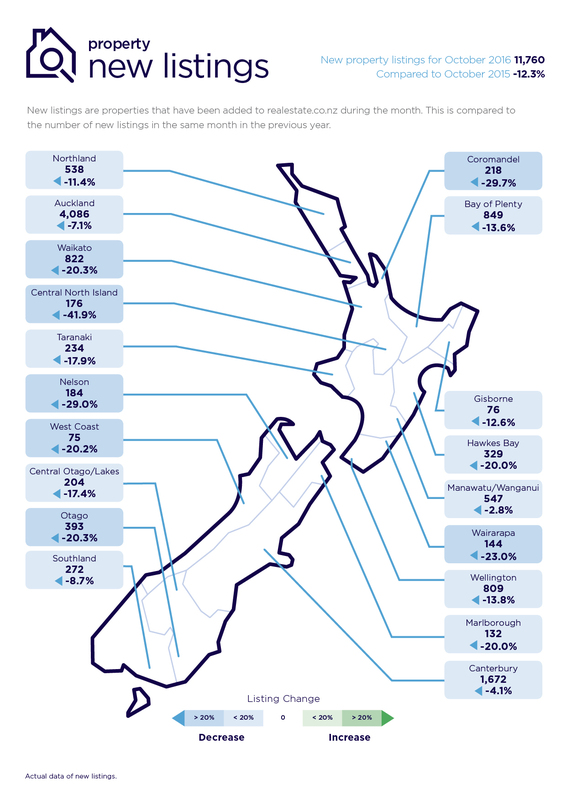 While Auckland was up slightly (1.4 per cent), nationally the total housing stock levels fell dramatically (by 24 per cent) when compared to the same month last year. “Big kudos to Taranaki for being named by the renowned ‘Lonely Planet Best in Travel Awards 2017’ as the second-best region in the world people should visit next year,” says Brendon Skipper. “But it’s not just global travellers who have turned their attention to Taranaki,” he says. New demand statistics generated by realestate.co.nz show that Aucklanders outnumber locals in terms of searching the region’s property offerings. “It’s a hot destination and the market reflects its growing status,” says Brendon. 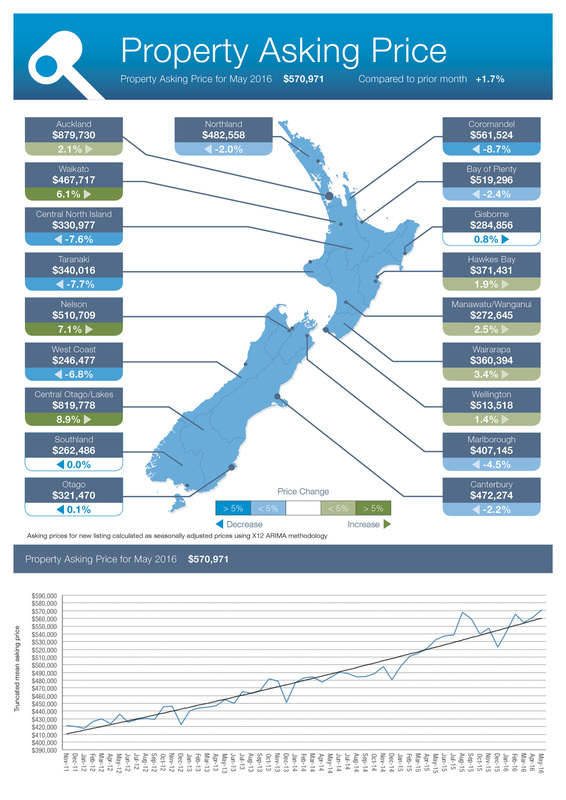 Taranaki property prices are now at an all-time high at $384,401, which is up 5.2 per cent on the previous month (September 2016). There’s also a shortage of listings, down 28.1 per cent compared to October 2015. “It’s a classic supply and demand situation,” says Brendon. The traditional lift in housing market activity during September failed to eventuate, highlighting the unpredictable nature of the property market in 2016, says realestate.co.nz spokesperson Vanessa Taylor. Real-time market statistics from realestate.co.nz show new property listings across the country down by 12.2 per cent on the same time the previous year, and the total housing stock down 23 per cent. “Typically we can see trends around what happens during the different phases of a year, such as a slow-down in the winter months and a resurgence in spring, but 2016 is The Year of Unpredictability,” says Vanessa. 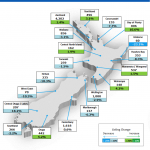 Auckland was the only region in the whole of the country where total housing stock levels increased (by 4 per cent). 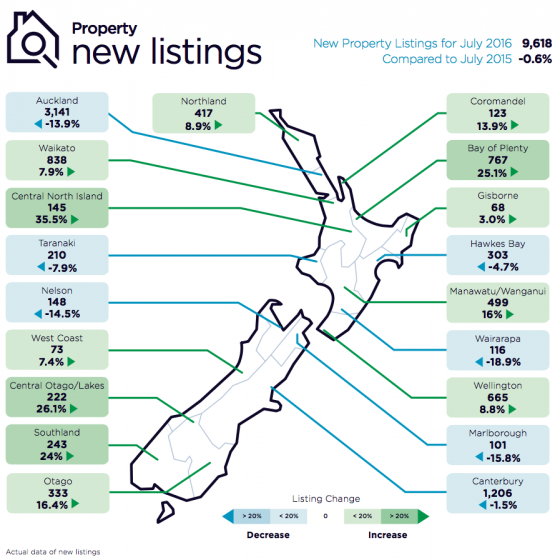 However new property listings in September were 17.8 per cent lower than the same month in 2015. While Auckland asking prices hit another all-time high at $933,435 (a 2.8 per cent increase on the previous month), properties are spending longer on the market. “With fewer new listings coming onto the market, it appears that sellers are looking to command higher prices,” says Vanessa. “On the other hand, if there were no new listings coming onto the Auckland market, all existing properties would now take 12 weeks to sell, which indicates a slow-down in activity,” she says. By comparison, in the same period last year (September 2015), if there were no new listings coming onto the Auckland market, all existing properties in Auckland would have taken 9.6 weeks to sell. Vanessa says it could be that the buyer sentiment has shifted from a “must buy now mentality at all cost” to a more considered view of options, particularly with prices continuing to rise and a limited choice of properties for sale. Waikato’s total housing stock level plunged 31.9 per cent compared to the same month last year which is a massive drop compared with neighbouring Auckland which was the only region where total housing stock levels rose. New property listings coming onto the market in September in the Waikato fell by 20.1 per cent compared to the same time last year and asking prices lifted by 3.0 per cent on the previous month, which is slightly higher than Auckland. If no new listings came onto the market, all existing properties would be sold in 10 weeks in the Waikato region. 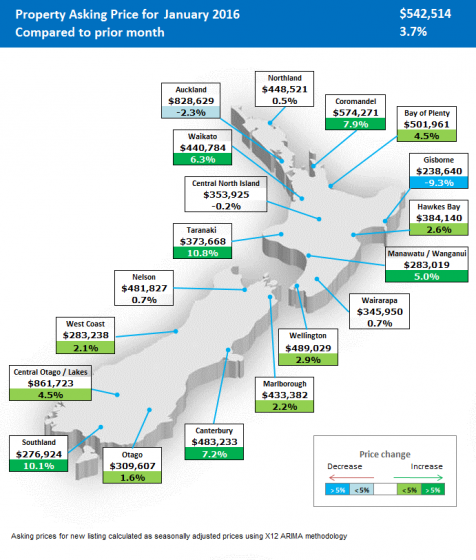 It’s a similar picture in the Wellington region where new property listings fell 8.1 per cent in September compared to the same time last year. “However Wellington is an example of the unpredictable nature of the industry at this time, given that in August 2016 new listings increased by 36.8 per cent compared to August 2015,” says Vanessa Taylor. Total housing stock in September 2016 was 37.7 per cent lower than the same month the previous year. 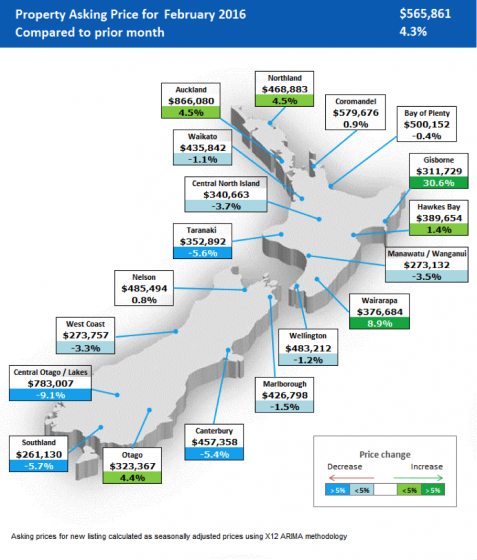 Property asking prices in Wellington rose 1.4 per cent compared with the prior month. While asking prices in the North Island main centres continued to rise, in Canterbury and Otago they fell by 2.5 per cent and 1.7 per cent respectively compared to the prior month. New listings were also down compared with the previous year, with Canterbury falling by 4.7 per cent and Otago by 12.6 per cent compared to September 2015.
realestate.co.nz is dedicated to property and is the of cial website of the New Zealand real estate industry. As a property listing site, the information it draws on for its property report is in real time. realestate.co.nz has the country’s most comprehensive selection of real estate listings online. The site presents more than 97 per cent of all residential, commercial and rural properties currently marketed by real estate professionals. Focussed exclusively on people in need of property, realestate.co.nz offers superior functionality, including accurate search, school zone data and a mobile app. 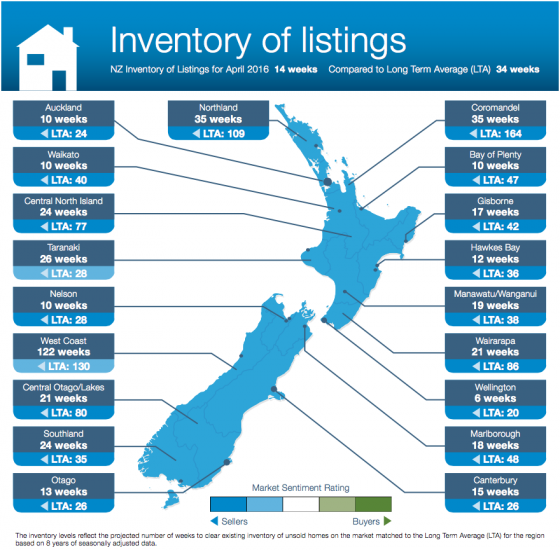 New listings are a record of all the new listings on realestate.co.nz for the relevant calendar month. As we re ect 97 per cent of all properties listed through registered estate agents in New Zealand, this gives a representative view of the market. Truncated mean is the method we use to provide statistically relevant asking prices. The top and bottom 10 per cent of listings in each area are removed before the average is calculated, to prevent exceptional listings from providing false impressions. 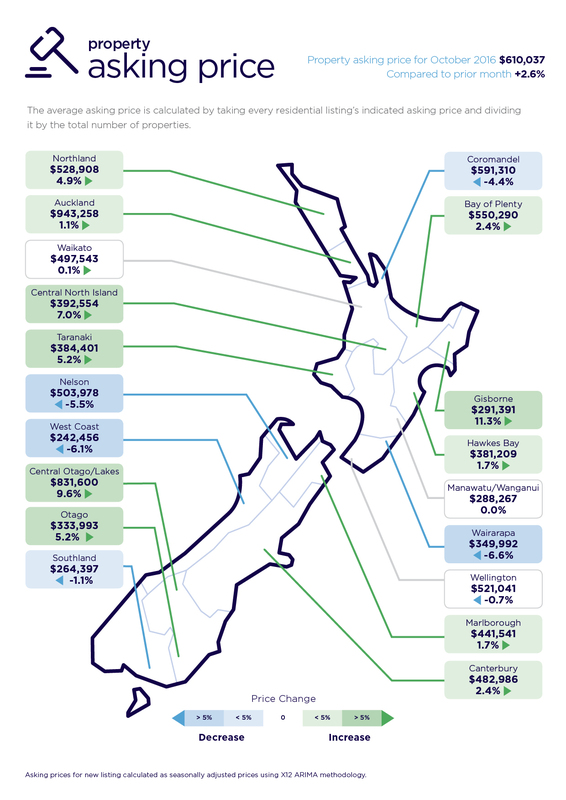 The full report can be downloaded here..
Low levels of housing stock in some regions of New Zealand are continuing to benefit sellers, according to figures released today by realestate.co.nz. Real–time market statistics from the site, which has the largest number of residential for sale property listings in the country, show that with the exception of Auckland, there has been a gradual decline in housing stock over and above the typical midwinter seasonal lull. “This has resulted in a lift in asking prices, most notably in the Coromandel, where the region had only 141 new listings and yet hit $636,297 for the average asking price. 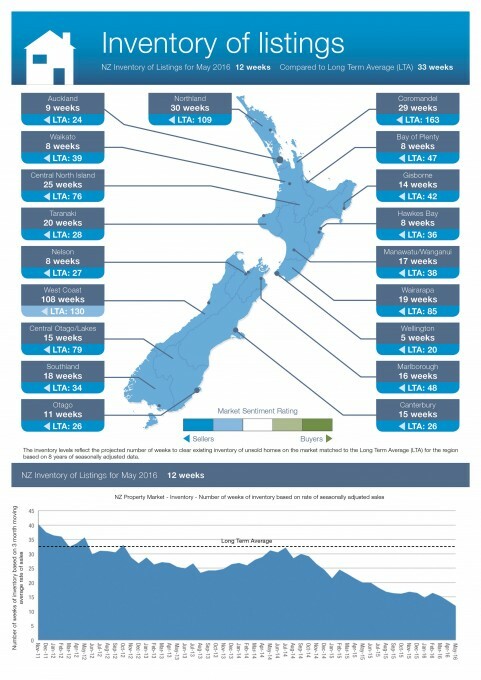 This is up 7.2 per cent from the previous month and is an all-time high,” says realestate.co.nz CEO Brendon Skipper. Coromandel is just one of six regions nationally that have hit an all-time high in August. The other five regions are Canterbury, Nelson & Bays, Bay of Plenty, Waikato and Auckland. With inventory levels continuing to fall, the property market remains a sellers’ market. “Nationally, it means that if no new listings were to come to market, all the existing properties in New Zealand would be sold in 14 weeks. “Auckland is the only region in the whole of New Zealand where housing stock is up compared to the same time last year. However, demand appears to be easing compared to the rest of the country,” says Brendon. The number of new listings in Auckland dropped by 12.4 per cent compared to the previous year, however the total Auckland housing stock levels are up by four per cent for the same period. “This tells us that homes are taking slightly longer to sell, which could be as a result of LVR restrictions,” says Brendon. Taking a snapshot in a moment of time on one day in late August, there were 21,462 houses for sale across New Zealand, which is down 24.8 per cent from the previous year. “This number can be misleading as it doesn’t take into account the number of properties which have come onto the market during that month and subsequent sales, but it does tell us it is still very much a sellers’ market. 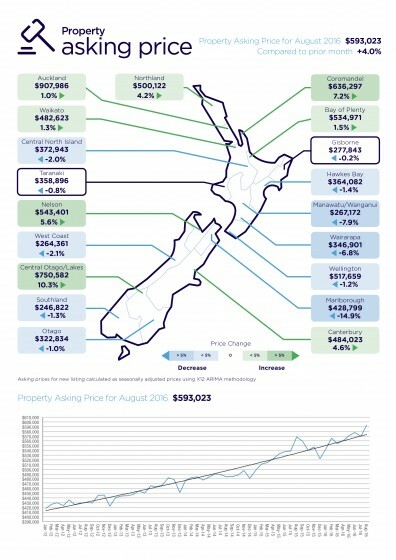 “The market data we draw from realestate.co.nz shows that the average Auckland asking price for all residential property types was $907,986 in August, which is yet another record, but still has some way to go before hitting the $1 million mark,” comments Brendon. Realestate.co.nz is the official website of the New Zealand real estate industry. As a property listing site, the information it draws on for its property report is in real time. At realestate.co.nz we make the complex simple. We’re New Zealand’s number one property site with the most properties for sale from every real estate brand in the county. We are totally dedicated to property, have no private sales and have search functionality that’s second to none to get you to your perfect property faster. 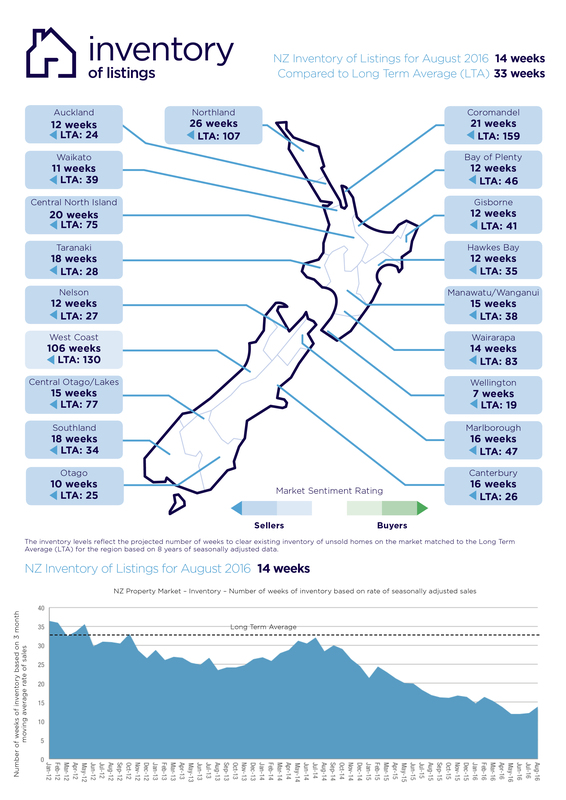 New listings are a record of all the new listings on realestate.co.nz for the relevant calendar month. 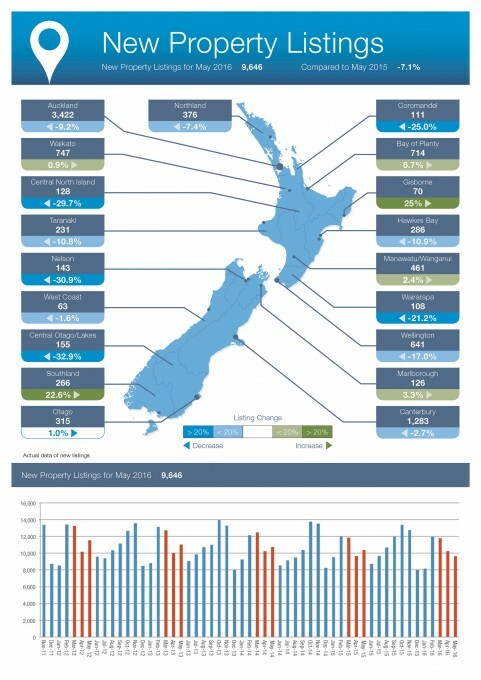 As we reflect 97 per cent of all properties listed through registered estate agents in New Zealand, this gives a representative view of the market. 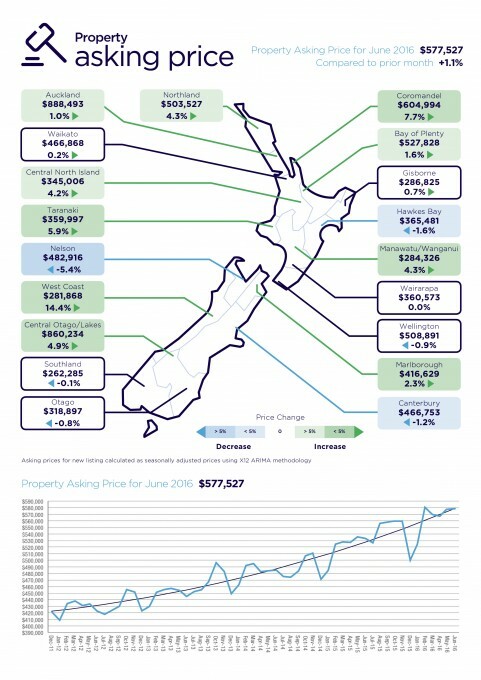 Real-time market statistics released today by realestate.co.nz show that in July, the seasonally adjusted asking price for homes across the country fell by $7,556 (1.3 per cent) when compared to June 2016. The average national asking price in July was $569,971. 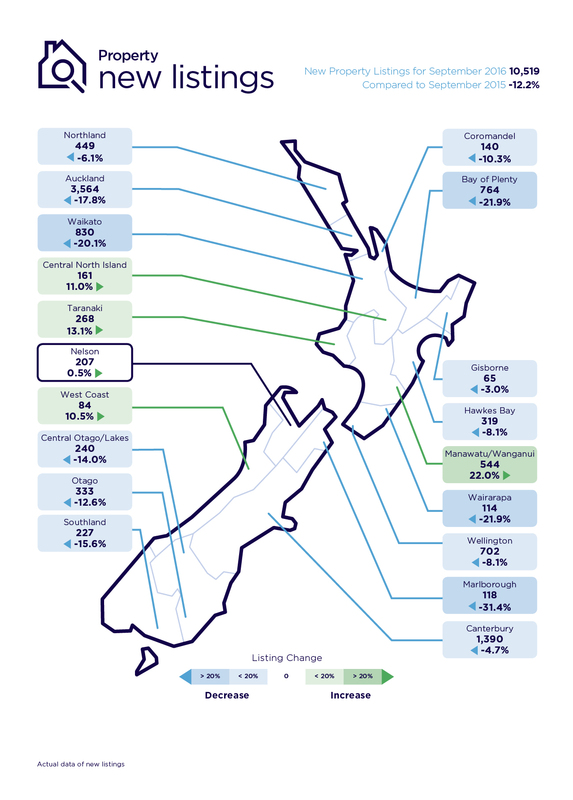 On the demand side, there was a 10.39 per cent decrease in viewing sessions for Auckland properties on realestate.co.nz when compared with the same time last year and users also dropped by 4.90 per cent. This continuing trend was first referenced in last month’s property report and reinforces the possibility that the shine may have gone off the Auckland market. Nationally, demand increased by 14.48 percent when compared with July 2015. Other regions which saw an increase in viewing sessions were Canterbury and Central Lakes/Otago both at 11.40 per cent, Marlborough with 19.03 per cent and Wellington with a very large 22.52 per cent increase. ‘Significant variations in asking prices across the country paint an interesting picture’, says Vanessa. Auckland still continues its upward trajectory, with the July average asking price at a record high of $898,562 (up 1.1% from the previous month). “There have been calls across the nation for measures to rein in house prices, but it may be that the market is actually self-correcting, albeit slightly, with buyers unwilling or unable to meet ever-increasing price rises. “Whether the fall is the start of a trend is still to be determined,” she says. “In addition to Auckland, the main centres where asking prices continued to increase were Waikato, Wellington and Otago, but in Canterbury it’s a different picture where asking prices fell for the third month in a row in July,” Taylor says. The July asking price in Canterbury stood at $462,936, almost $10,000 lower than in May this year ($472,274) but demand is still high. An 8.33 per cent increase in sessions from June and 11.40 per cent increase on July 2015. There have also been some highs and lows in the regions, with Central Lakes/Otago asking prices falling 20.9 per cent compared with the previous month. While this could be a one-off (dropping to $680,672) it’s still significantly lower than the same time last year ($756,063 in July 2015), comments Vanessa. At the two ends of the country, asking prices have also fallen. In July the Northland average asking price stood at $480,006, a 4.7 per cent fall from June (down from $503,527). Southland also recorded a 4.7 per cent fall, with the average asking price in July standing at $250,041, down from $262,285 in June. By contrast, Nelson and Marlborough are on the up, with Marlborough the star performer. Average asking prices in the lifestyle region of Marlborough hit the half-million-dollar mark for the first time ever ($503,997). The figures show that Marlborough had a large increase in demand in July, a month on month increase of 10.94 per cent with a large 19.03% increase on July 2015. The variances across the country are also reflected in the number of new properties coming onto the market, which have remained relatively static nationally compared to the same time last year (down 0.6 per cent from July 2015). For example, regionally we see new listings down by 18.9 per cent in Wairapapa on the same time last year, while at the other extreme Central North Island was up by 35.5 per cent. On 27 June, the Reserve Bank released official statistics for the first time showing that in May 2016 some 40 per cent of all mortgage lending was on interest-only payment terms. This percentage has been “fairly stable” since the data was first available to the Reserve Bank in July 2015. For example, in Auckland where asking prices continue to rise, investors theoretically would receive 3.28 per cent yield over a 12-month period – based on our calculation of average asking price vs weekly rental price, excluding all external costs. 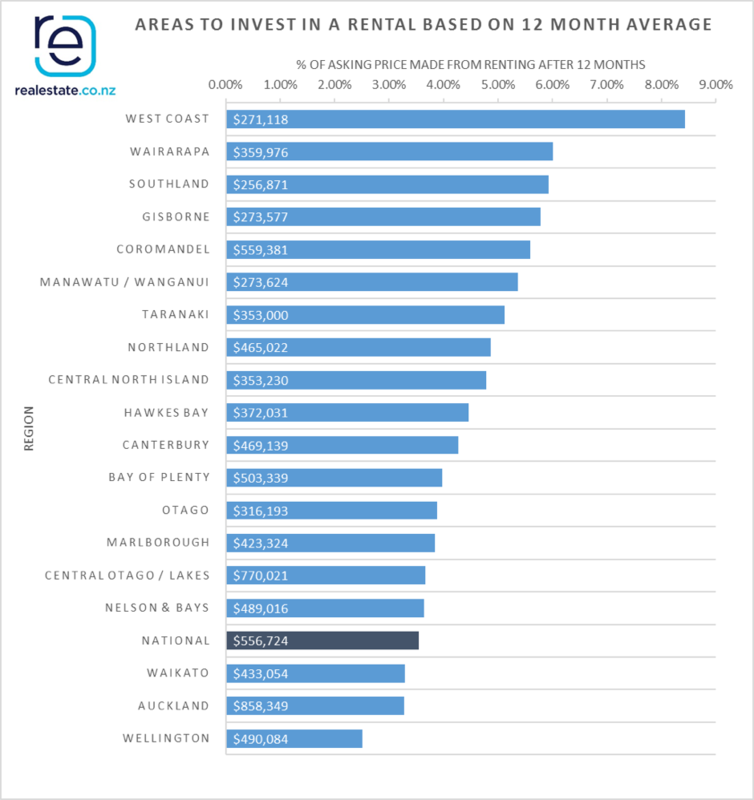 Waikato, Auckland and Wellington respectively take up the bottom three spots below the national average, while regional areas dominate the higher returns. West Coast (8.44 per cent), Wairarapa (6.01 percent) and Southland (5.93 per cent) fill the top three spots across the nation. Realestate.co.nz is dedicated to property and is the official website of the New Zealand real estate industry. As a property listing site, the information it draws on for its property report is in real time. Truncated mean is the method we use to provide statistically relevant asking prices. The top and bottom 10 per cent of listings in each area are removed before the average is calculated, to prevent exceptional listings from providing false impressions. Read more here. Interest in the Auckland property market has dropped on the back of ever increasing house prices and falling returns for investors. Auckland average asking prices rose again to another all-time high in June to $888,493, but searches on realestate.co.nz for properties in the city has fallen, says CEO Brendon Skipper. “It could be a turning point for Auckland, with prices now at an all-time high they’re almost out of reach for the average income earner, with first home buyers the hardest hit,” he says. During June, the number of users searching Auckland houses ‘for sale’ on realestate.co.nz fell by 19.33 per cent compared to the same time last year. The site also measures engagement and in June it fell by more than a third across the Auckland region when compared to June 2015. “Nationally, the volume of traffic to our site is comparable across the country for this time of year, but it appears buyers are moving away from looking in the Auckland area in favour of other regions,” comments Brendon. Searches for properties in Northland, Hamilton, Tauranga and Queenstown were up significantly in June compared to the same period last year. “It appears Aucklanders still want to stay in relatively close proximity to our biggest city, but in terms of affordability they are forced to move even further afield, or they are making lifestyle changes,” he observes. Hot spots in Northland are Waipu, Whangarei Heads, Paihia and Tutukaka which all have a significant increase in users looking in those areas. “Whangarei Heads is the suburb to watch, with online engagement up by 42 per cent on same time last year,” notes Brendon. In the Far North, Kerikeri Surrounds, Paihia and the Karikari Peninsula were the most searched. Further south, Hamilton and Tauranga continues to attract high levels of online engagement and Queenstown continues to be a perennial favourite,” says Brendon. Auckland property investors are taking a hit on their theoretical yield in the rental market. 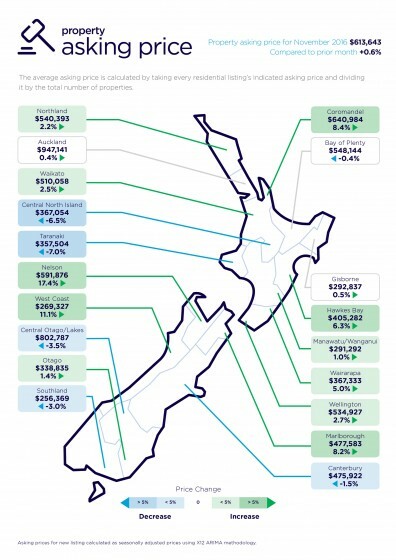 “Investors buying a house in June at the average price of $888,493 theoretically would receive 3.18 per cent yield on the average rent in Auckland – based on our calculation of average asking price vs weekly rental price, excluding all external costs,’ explains Brendon. “This puts them at the bottom of the ladder across all 19 regions.” See chart below. Nationally, the average theoretical yield on a property is 3.96 per cent (based on the average price and rented out at the average asking rental price). By comparison, the star performer in terms of theoretical yield on investment property is Otago, showing an average yield of 7.32 per cent. Across the nation, sellers are coming back in the market with 15 out of the 19 regions showing an increase in new listings compared to the same time last year. “This is significant, as June is traditionally a quiet time of the year, on a par with December and January” explains Brendon. “The message seems to be getting through that with the shortage of listings and the speed in which properties are selling. It’s a sellers’ market. “While there is still a shortage of listings this is a positive sign for getting more equilibrium in the marketplace,” he says. Realestate.co.nz is dedicated to property and is the official website of the New Zealand real estate industry. As a property listing site the information it draws on for its property report is in real time. Realestate.co.nz has the country’s most comprehensive selection of real estate listings online. The site presents more than 97% of all residential, commercial and rural properties currently marketed by real estate professionals. Focussed exclusively on people in need of property, Realestate.co.nz offers superior functionality, including accurate search, school zone data and a mobile app. New listings are a record of all the new listings on Realestate.co.nz for the relevant calendar month. As we reflect 97% of all properties listed through registered estate agents in New Zealand, this gives a representative view of the market. 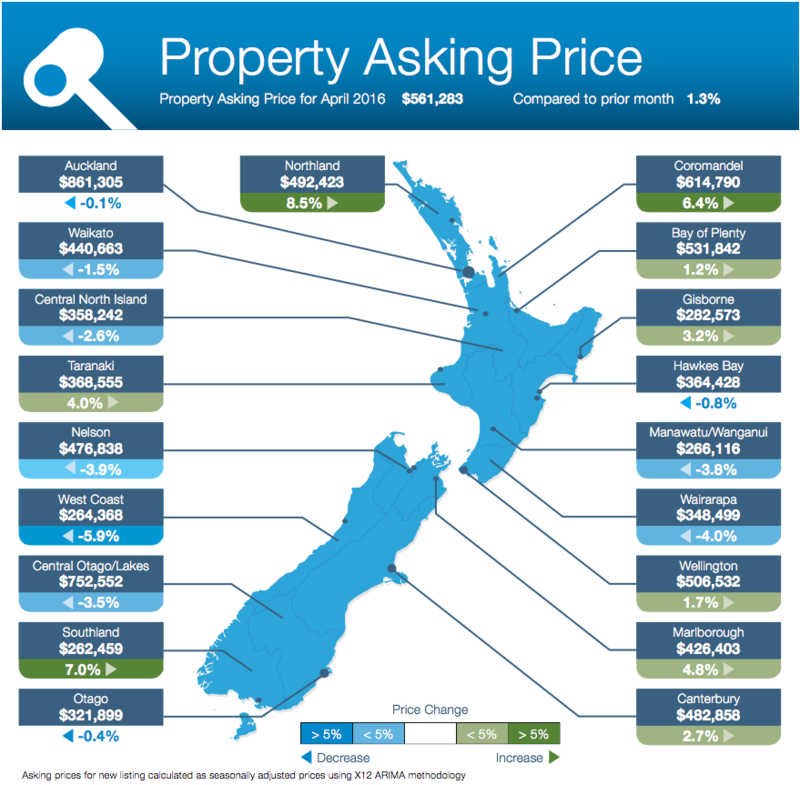 The average asking price for a New Zealand house hit an all-time high with stock at an all-time low for May 2016, in a market which is heavily favouring sellers. 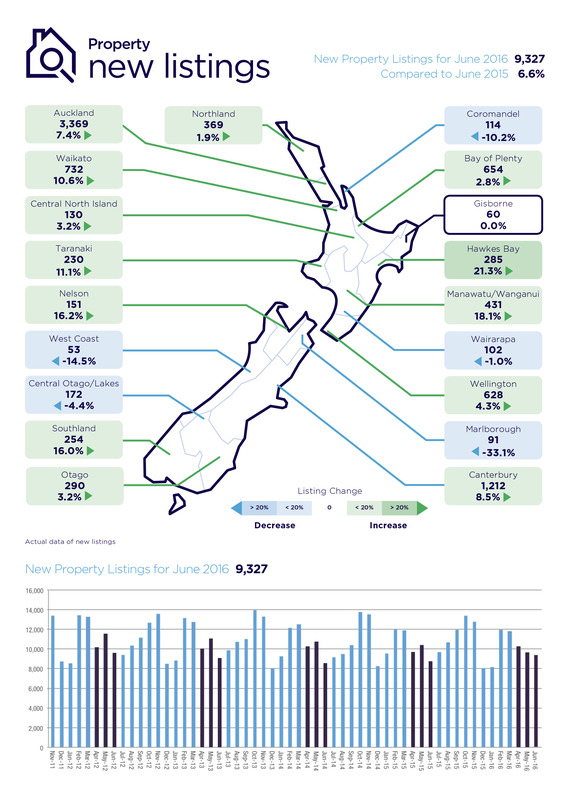 Real-time market statistics released today by Realestate.co.nz show the May national average asking price reached $570,971, up 7.2 per cent from the same time the previous year. On the supply side in May, the number of new properties that came onto the market nationally dropped 7.1 per cent from the previous month and the long term average has also fallen. “In this environment, if no new listings were to come onto the market nationally and all the existing properties sold, theoretically there would be no properties for sale in New Zealand within 12 weeks,” says Realestate.co.nz spokesperson Vanessa Taylor. “It’s a classic supply and demand situation and right now it’s definitely a sellers’ market,” she says. 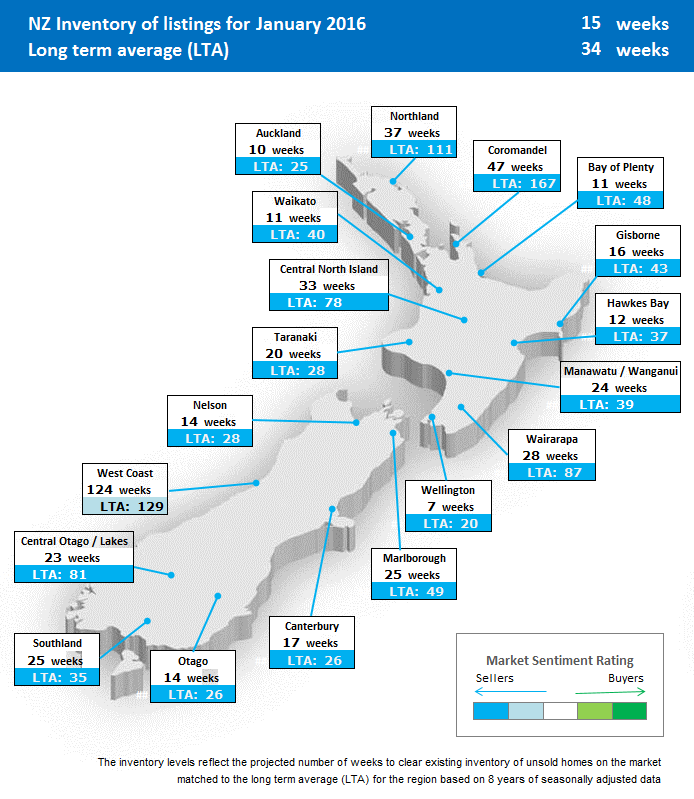 Heightened real estate activity has been evident across both the North and South Islands. In May, the Central Otago/Lakes topped New Zealand in terms of percentage average asking price at 17.2 per cent, the region also recorded the largest drop in new property listings down 32.9 per cent, both compared with the same time last year. The average asking price for Central Otago/Lakes region for May hit $819,778. Traffic data reveals a sharp increase in users residing in the neighbouring Otago region viewing property in Central Otago/Lakes, with engagement up by 75.98 per cent on the same time last year. At the other end of the South Island, it’s a similar story for Nelson, which recorded a record high asking price of $510,709 and a significant drop in new property listings (down 30.9 per cent on the same time the previous year). In April, Realestate.co.nz reported an all-time low in the number of properties for sale in Wellington. In May, inventory levels dropped even further in the capital city. Theoretically, if no new listings were to be posted to the site and the existing properties sold, there would be no properties for sale in just 5.1 weeks (compared with 5.6 weeks in April 2016). “Waikato also has an interesting profile,” says Vanessa Taylor. “Asking prices are up a healthy 6.1 per cent on the previous month, coming closely behind Nelson and Central Otago/Lakes in terms of percentage increases across the country,” she says. 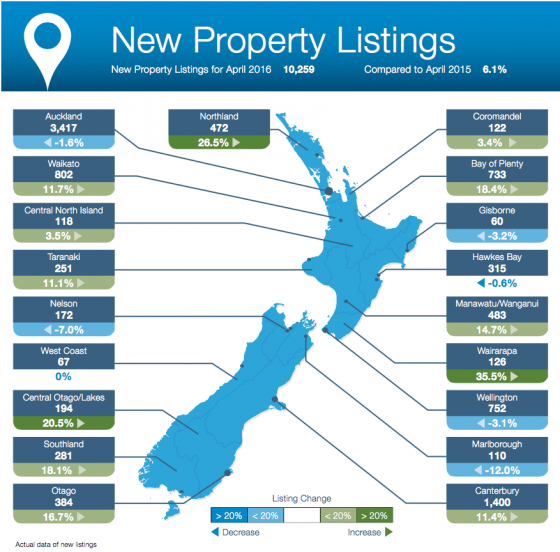 “At the same time new listings remain relatively static in the Waikato region. “We could be tempted to make an assumption that Aucklanders are looking further south to the Waikato. 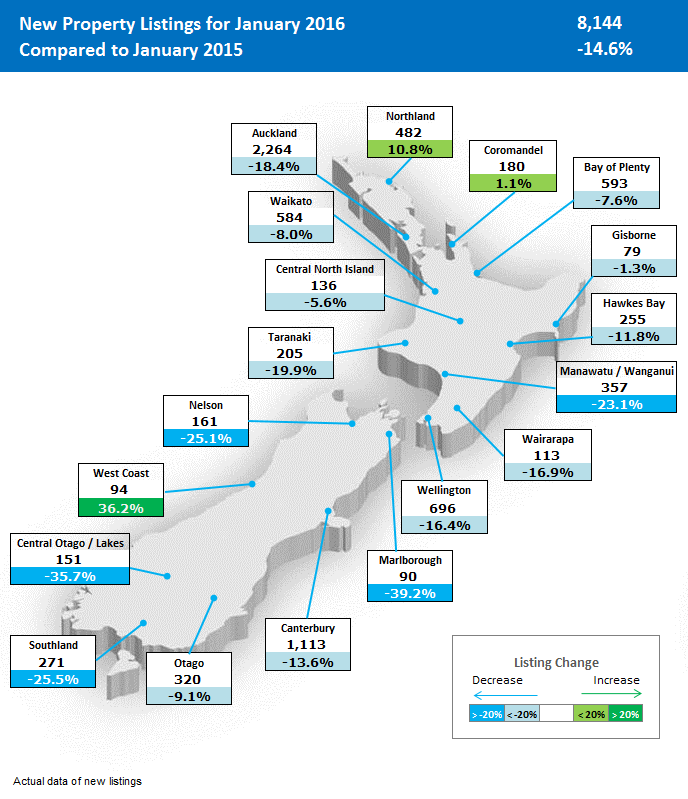 However data shows us that we have seen a strong (75.35 per cent) increase in users from the Bay of Plenty looking at the region. In saying that, the strongest interest is actually coming from users who already reside within the Waikato region,” she says. The average asking price in the Waikato is $467,717 compared to Auckland where it stands at $879,730. Auckland is also suffering a fall in inventory levels, with listings down 9.2 per cent on the same time last year (May 2015). “A fall of close to 10 per cent in listings in one year in a city the size of Auckland is very significant,” says Vanessa Taylor. 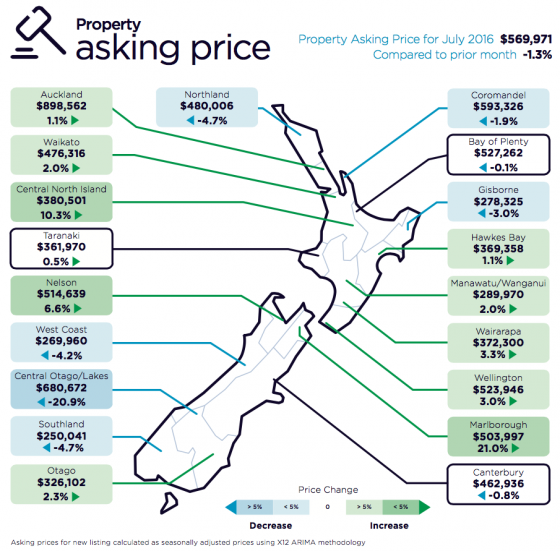 “At the same time Auckland asking prices have risen in the past month by 2.1 per cent (compared with April 2016) albeit off a high value base,” she says. 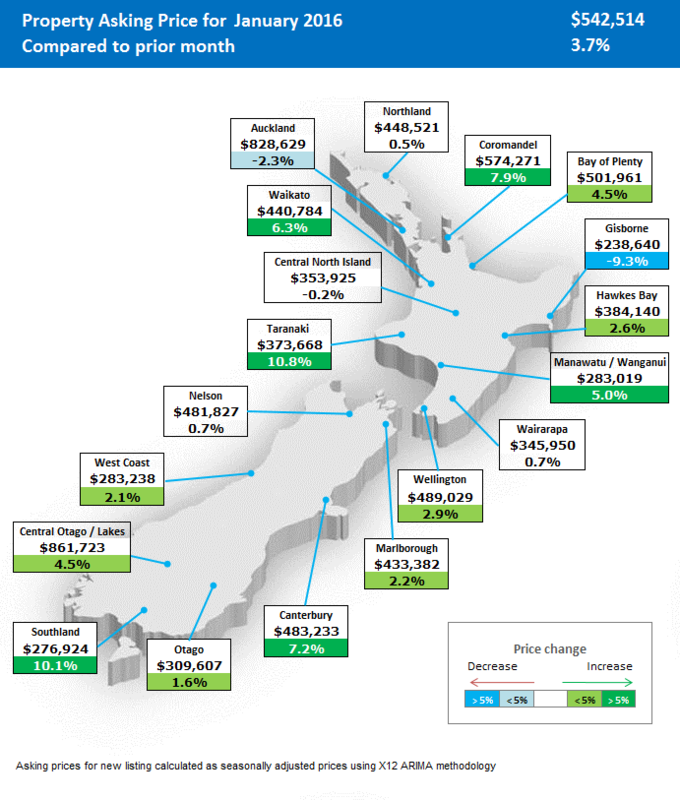 Auckland asking house prices have risen 10.9 per cent compared to the same time last year (May 2015).